residences built in the 1880’s that you could easily miss if driving by in a car, or even pedaling fast on your bike. The resident owner of 140 Highland Avenue, who prefers to remain unnamed, purchased this Queen Anne style house roughly 25 years ago. Over the years he has laboriously repaired and restored features with great respect for every detail of the original design. He received high public recognition this year for his restoration work by the City’s Historic Preservation Commission, as part of their 2014 Preservation Awards Program. 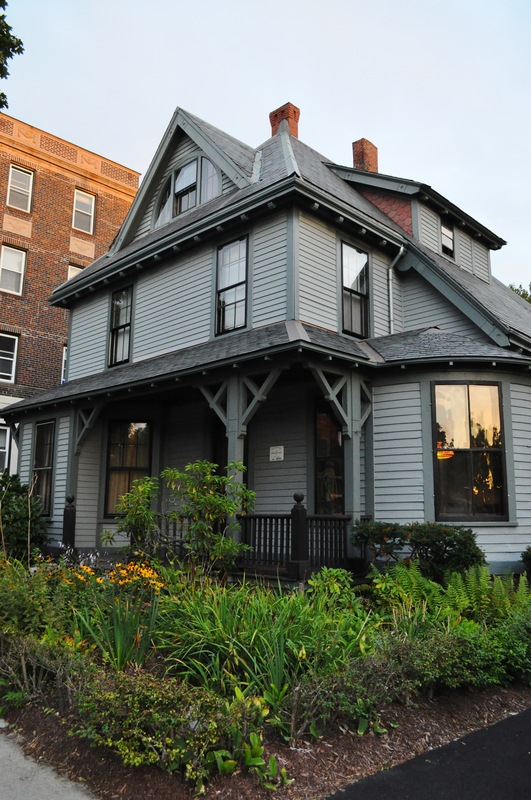 Known as the Robert Luce House, it is locally designated and also listed in the National Register of Historic Places. Although originally from Maine, Mr. Luce lived in Somerville for many decades (1874-1945) and was known as a distinguished statesman who served in both the State Legislature and the U.S. House of Representatives. The house was originally owned by Walter S. Barnes, whose company manufactured boxes in Boston. When he purchased the house the owner said the front had a series of aluminum windows. He asked the Commission how he could enhance the historic character of the property, and they noted that the windows detracted from the original architecture. He decided a first step was to remove and replace them with wood ones. He then resolved to restore other features, such as the front porch which had an asphalt roof instead of the original slate. When he started work on the roof the owner discovered that the porch likely once wrapped around the house this, and that all of the Stick-style braces supporting the roof had been removed. He carefully restored the original rafter tails beneath the roof, and repaired or replaced in-kind the clapboards, trim and comer boards. Next he tackled restoration of the round room, visible on the right side of the house, which he thinks may have been added soon after the house was built. The curved windows posed quite a challenge as they are made with 1/4″ curved glazed glass. First, he removed the wood trim and lead weights inside, stripped the old layers of paint, refinished them, and then reinstalled the glass. Lastly, the owner wanted to make curved storm windows, so he decided to use old growth wood which is much stronger and doesn’t rot as quickly. He recalled the strong odor of tree resin while working with this old wood, as if it was freshly lumbered the day before. Brought back to its original beauty this round room at the front of the house now serves as his quiet workspace.